One year when I was a girl, my mother made me a Twelve Days of Christmas box. There was a partridge in a pear tree on top and felt figures for the rest of the days on the sides of a round hat box. covered with dark green felt. Inside were twelve little packages, one to open each of the twelve days of Christmas. On the third Christmas after her too early passing in 1988, I made this accordion book to celebrate our love and the joys of making and giving. You can see photos of all the pages on flickr. 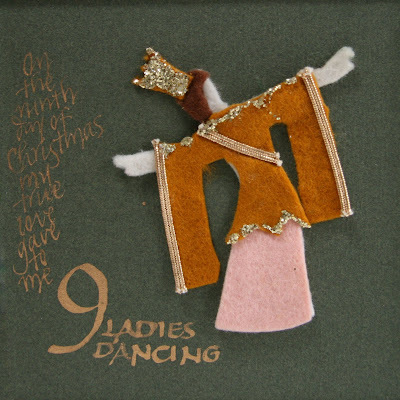 And my favorite Twelve Days of Christmas illustrated books at my making books blog.